The Golden Mean is a number that mathematicians have given the name Phi (?). It is a never ending (irrational) number and its value is approximately 1.618. 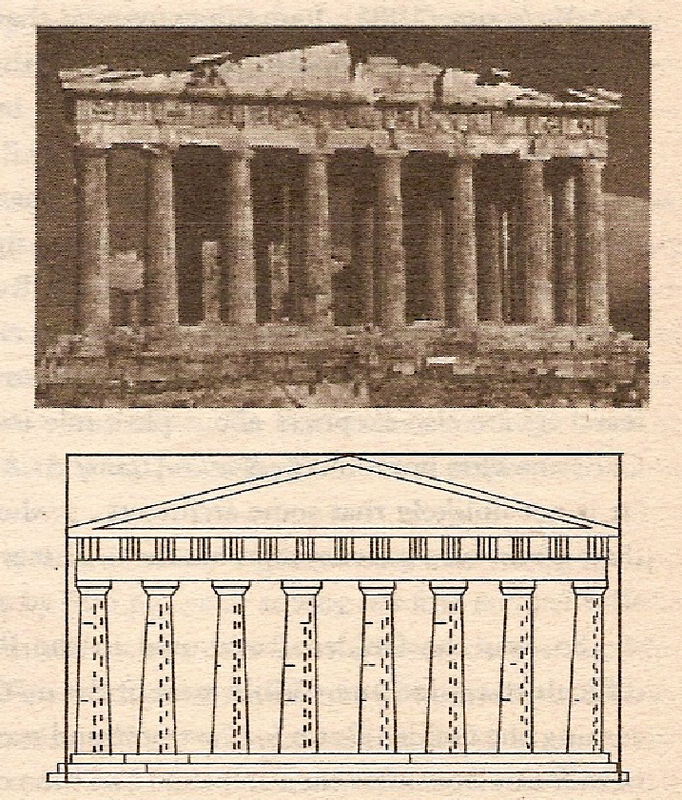 It was first defined by Euclid in 300BC, and is regarded as the ideal ratio of the lengths of sides in designs. Euclid defined the Golden Mean as dividing a line into two segments so that the ratio of the lengths of the two segments is the same as the ratio of the total length of the line to the length of the longest segment. You can check for yourselves that (1 + 1.618)/1.618 is equal to 1.618. I will give the proof later – it involves a bit of algebra! 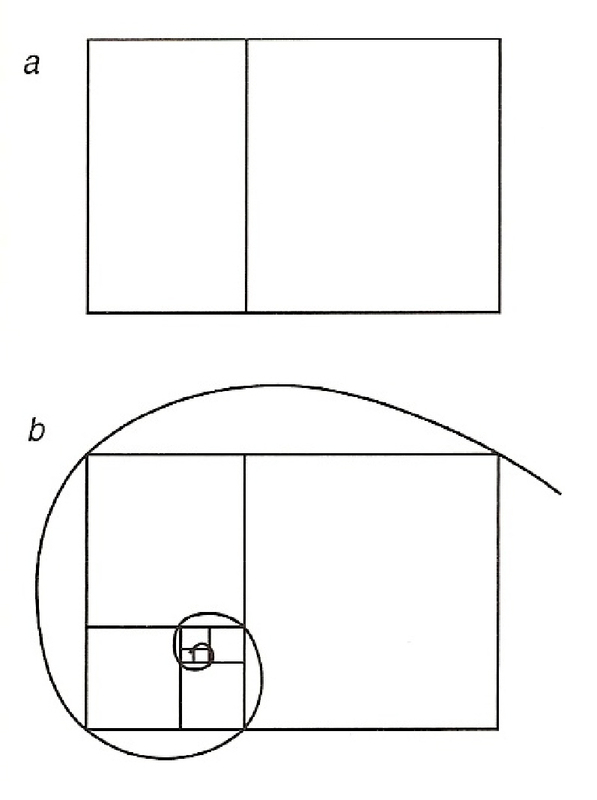 I will also show how to construct a “Golden Rectangle” having the “ideal” shape with its sides in the ratio 1.618:1. 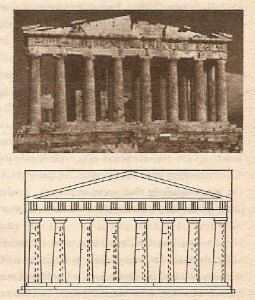 Ancient Greek architects and sculptors made extensive use of the Golden Mean in the design of buildings such as the Parthenon and also in the proportions of the sculptures in it. Twentieth century mathematicians coined the name Phi in honour of the Ancient Greek sculptor Phidias who designed many of these works. Since then the Golden Mean has been used by artists and architects as an important criterion in design to give pleasing proportions. Many artists divide their paintings according to the Golden Mean to place the focus of the design in the best place. 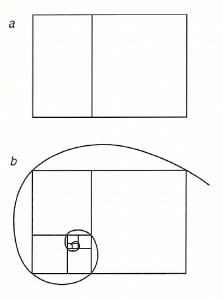 Although the Greeks argued that the Golden Rectangle was the most pleasing shape, this is not really recognised today. 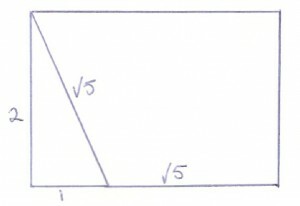 Most paintings and photographs have side ratios closer to 1.5:1. A modern wide screen television has a picture with the sides in the ratio 1.8 to 1. These ratios are all approximately the same as the Golden Mean but not exactly so. However during the 20th century the famous architect Le Corbusier did use the Golden Mean extensively when designing his buildings. 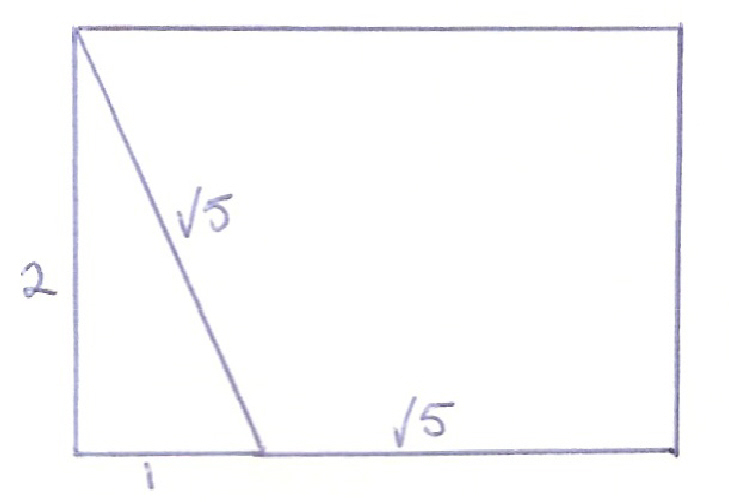 If you cut a square off the Golden Rectangle, the remaining rectangle is also “Golden”. You can go on cutting off smaller and smaller squares in this way till you get to a point called “The Eye of God”. If you start at the Eye of God and connect successive corners of the squares you generate a curve called a “logarithmic spiral”. I will show later that these curves are very important in nature. The Eye of God is the focal point of the Golden Rectangle. It is approximately one third of the way in and one third of the way up. Many artists use this as a place to put the main feature of their painting. We start with one pair that in month one gives birth to a new pair so we have two pairs. In month 2 the first pair produces another pair but the second does not so we have 3 pairs. In month 3 the first two pairs each produce another pair so we have 5 pairs. In month 4 the first 3 pairs give birth so we have 8 pairs. In this way we can construct the series 1 2 3 5 8 13 21 34 and so on. Each succeeding number is the sum of the two previous numbers. I will show later by another bit of algebra that as you move up the series the ratio of each term to the preceding term becomes constant, and, is the same as the Golden Mean. At the time this was regarded as somewhat magical and you might wonder what rabbits have got to do with mathematics. In the nineteenth and twentieth centuries mathematicians and other scientists began to realise that the Golden Mean and the Fibonacci Series crop up in all sorts of things, ranging from the structure of plants and flowers to the structure of galaxies. The Golden Mean is now regarded as one of the most important constants in science ranking alongside numbers like Pi (? – the ratio of the circumference of a circle to its diameter). In nearly all flowers the petals are arranged as rings of Fibonacci numbers. For example lilies have 3, buttercups 5, delphiniums 8, marigolds 13, asters 21 and daisies 34. Plant leaves are arranged in a spiral around the stem so as not to shade each other. It turns out that the most efficient way of doing this is to arrange the spirals as Fibonacci numbers. In beech and hazel twigs the spacing is 1/3 of a turn between leaves. Apple and apricot twigs have 2/5 of a turn, while pear and willow twigs have 3/8 of a turn. In each case spacing is the ratio of two alternate numbers in the Fibonacci Series. 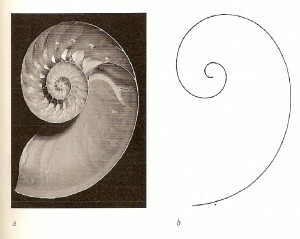 The explanation of the spiral is that the growth of a stem occurs at the tip. Infant buds are formed at intervals around the tip. As the stem grows longer the buds grow in a spiral around the stem. In 1979 a mathematician named H. Vogel used a computer simulation to show that the most efficient way that leaves can be arranged round a stem is at a preferred angle of 137.5°, which he named the “Golden Angle”. It turns out that the Golden Angle is the same as dividing a circle (360°) by Phi. Rose petals grow in a spiral with each pair of petals separated by the Golden Angle. If you try any angle other than 137.5° the pattern of packing is not so efficient. I mentioned earlier that if you divide a Golden Rectangle into successively smaller squares, you form a logarithmic spiral. This shape is a spiral in which, as you go round it, successive loops have diameters increasing in proportion to the Golden Mean. As the spirals get bigger the basic shape does not change. It looks the same whatever magnification you use to see it. Nature loves logarithmic spirals, and many natural objects including the seeds on a sunflower, snail shells and even spiral galaxies form in logarithmic spirals. 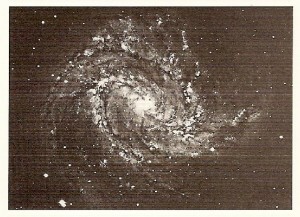 Whirlpools and hurricanes are other examples of the logarithmic spiral. Artists use logarithmic spirals when drawing things like clouds and turbulent rivers. In 2000 the biologist Vance Tucker showed that predator birds like falcons attack their prey by flying in logarithmic spirals. He showed that this happens because with their eyes fixed in the sides of their heads, the spiral is the fastest way to close in on the prey without turning their heads. As a snail grows wider and longer inside its shell, it needs to keep building bigger and bigger chambers in which to live, but its shape does not change. Hence the shell grows in a logarithmic spiral as the perfect shape to accommodate the growing snail. Other molluscs grow in the same way. Ammonite fossils can be formed as very large logarithmic spirals. In 1991 two French physicists made an experiment showing that the Golden Angle and the logarithmic spiral arise naturally from the dynamics of growth without divine intervention. They put a round dish of silicone oil in a magnetic field that was strongest at the outside of the circle. They dripped drops of a magnetic liquid into the centre of the dish at equal intervals. The successive drops repel each other and also move outwards at increasing speeds towards the stronger magnetic field. In this way the drops form a logarithmic spiral, with successive drops separated by the Golden Angle. Physical systems always settle into a state of lowest possible energy. The Golden Angle in a log	arithmic spiral represents the minimum energy positions for the mutually repelling drops. Buds do the same thing as they and the stem grow. 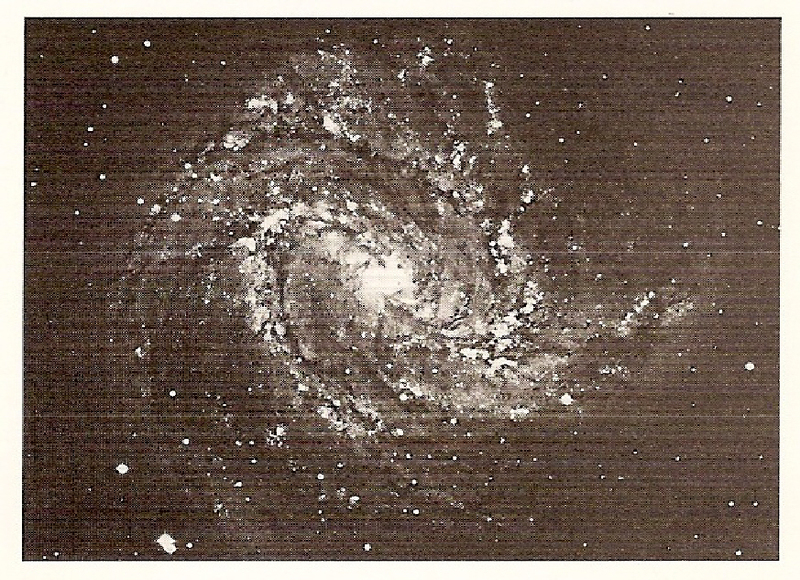 A spiral galaxy grows outwards from a central point in the same way.